Tech. Sgt. Daniel Boykin, 23rd Maintenance Group Operation Location-Alpha training instructor for the 823rd Maintenance Squadron, instructs Airmen on the proper procedures of CPR at Nellis Air Force Base, Nev., March 14. CPR is a lifesaving first aid procedure useful in a number of emergencies. 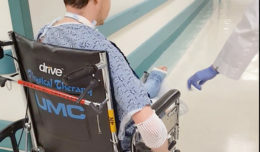 Training is a vital part of military life and to be able to put training into action in a quick and efficient matter can be the difference between life and death. A small training flight of four Airmen, assigned to the 23rd Maintenance Group Operating Location-Alpha and Detachment 1, of the 563rd Operations Support Squadron, stationed here are tasked with making sure Airmen of the 823rd Maintenance Squadron and 66th Rescue Squadron receive the essential training needed to complete their mission. Having such a small unit in charge of training a multitude of Airmen can be a daunting task. Accomplishing this task requires great leaders, teamwork and a lot of hard work to accomplish. Tech. Sgt. Daniel Boykin, 23rd MXG, OL-A training instructor for the 823rd MXS and Tech. Sgt. Amanda Cook, 563rd OSS, Det-1, 66th RQS, 563rd Rescue Group OL-A unit training manager and 823rd MXS unit training manger, exemplify these traits. The mission of the 823rd MXS is to maintain, service and inspect HH-60G Pave Hawk aircraft as well as to plan, schedule, and direct both scheduled and unscheduled preventative maintenance to maintain mission ready status. “The primary mission is search and rescue,” said Boykin. “That means anything from home station, temporary deployments, to deployments, if someone is in distress, no matter if it is civilian or military; the 823rd MXS comes to the rescue. Tech. Sgt. 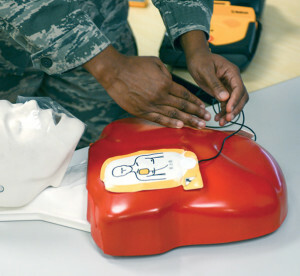 Daniel Boykin, 23rd Maintenance Group Operation Location-Alpha training instructor for the 823rd Maintenance Squadron, uses a dummy to show how to properly place the Automated External Defibrillator pads on a person during a CPR/AED training class at Nellis Air Force Base, Nev., March 14. Using an AED on a person who is having sudden cardiac arrest may save the person’s life. What the training unit provides includes but is not limited to CPR, form and documentation SABC, dedicated crew chief, auxiliary power unit, inlet and exhaust inspection, mission orientation and engine run. It’s a lot of material and Boykin is responsible to be a subject matter expert on all of it. As the 823rd MXS training instructor it’s a challenge that Boykin has taken head-on and exceeded expectations. In 2015, Boykin instructed more than 1,000 hours and won the 2015 Maintenance Professional of the Year Award in the instructor category. If one has ever attended a training class Boykin has taught, it is easy to see how he won this award. His ability to keep the class participants’ attention with properly timed humor and enthusiasm and knowledge for the subject is what puts him in the top tier of instructors. One of the biggest things he tells people who take his classes is that a lot of this training is also useful in their day to day life. One may never know when a situation arises and one must jump into action. A great example of this is the SABC program. While the instructor is an important aspect in training, it is also just as important to have a good unit training manager and Cook is just that. It’s a very demanding job as she is responsible for the 408 personnel of the 823rd MXS along with the 78 additional personnel from the additional squadrons she manages. She has a very unique set of job responsibilities that most other UTM’s don’t have. 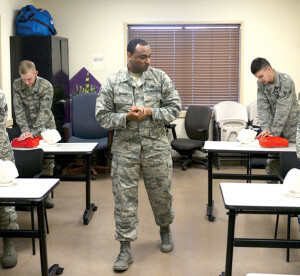 Both Boykin and Cook enjoy the unique challenges that their jobs at Nellis AFB bring and how it has developed their professional skills. The skills that this small training flight from the 23rd Rescue Group OL-A provides is essential to the readiness of Airmen. The great communication and teamwork between Boykin and Cook along with their dedication to their craft and hard work that they put in day in and day out to make sure these Airmen are getting the best training possible exemplifies what excellence is.